I wasn't raised religious, nor have I ever become so. If there was an official list of things I hated (maybe I'll make one? ), people trying to press their religious beliefs upon others would probably be a the top of that list. For some reason I got it into my head that this is what would happen during the "Pray" section of the book, but boy, was I wrong. In fact, I think I actually ended up enjoying that part of the book the most. I didn't find it religious it all, instead I found it spiritual — and spirituality is something that I can most definitely dig. And with over 10 million copies of the book sold worldwide, I'm obviously not the only one! I think Eat, Pray, Love was such a huge success because it made people step back and look at their lives and determine, like the author did, if it was really the life they wanted to be living. If it wasn't, what could be done to change that? In fact, a collection of stories called Eat, Pray, Love Made Me Do It was published earlier this year, in which numerous men and women detail how Gilbert's memoir personally affected them, and some of the stories are quite profound. While I can rant and rave about this book about how inspiring it was to me personally, I'd rather spend the rest of this blog post warning you against how horrible and inaccurate the movie version of this book was. When I say horrible, I mean horrible ... As in absolutely the worst book-to-movie adaptation I've ever seen! The movie overwhelming dwells on the "Eat" section of the book, practically skims over the "Pray" portion and totally misses the mark on the "Love" part. The movie makes it seem like Liz (played by Julia Roberts) is just a selfish and depressed white lady who takes on the White (Wo)man's Burden of traveling around the world and "saving" others to save herself. This could not be further from the truth and message of the book, and I actually had to shut the movie off before the end because I found it that upsetting. The long story short is, I don't care who you are, you should read this book. Whether you read it or not ... you should definitely not watch the movie. If there's one thing I absolutely hate, it's being told what to do — what to read, especially. Back during Twilight's reign of werewolves and vampires and when Fifty Shades of Grey first hit the scene, I couldn't count the number of times I was told "YOU HAVE TO READ THIS!" No. I actually don't. And just to prove that to you, I won't. Now, normally I embrace my quirks as part of who I am, but sometimes it backfires on me ... which leads me to why I am kicking myself for not reading The Hunger Games trilogy sooner. The Hunger Games was one of those series that everyone was talking about — and I mean everyone! I think Suzanne Collins came as close to being the next J.K. Rowling as humanly possible (after all, that woman is a deity). And because of my darn stubbornness, I avoided picking up The Hunger Games for that exact reason. Maybe I just wasn't mentally or emotionally prepared to invest in a new world where I knew a lot of characters would be killed off one by one (The jokes on me because George R. R. Martin has ruined my life that way many-a-time since then). But being that I'm particularly interested in working in a public library's youth services department and I didn't take any online classes this summer (I probably should have), I've assigned myself some fun homework until the fall semester begins: Read some of the most popular contemporary fiction for middle grade and high school students. I'm generally going to be reading more young adult books because, as I've said many times before, I LOVE YA! But I'll definitely also revisit a few classics stories that I read (or wish I had) in my younger days. Why not start this summer reading shindig off with a bang? My first self-inflicted assignment was to finally read one of the the biggest book-turned-movie successes since Harry Potter and The Lord of the Rings: The Hunger Games. And all I have to say now is I finally understand what the fuss was all about. I think one of the reasons I enjoyed the first book so much and am about to fly through the second one is because of Collins' ability to create such a strong and dynamic female main character that young girls everywhere needed (and still do) so badly. Katniss Everdeen is the definition of badass. Not only is she strong physically and mentally, her emotional strength yet simultaneous vulnerability can't help but make you fall in love with her (I get you, Peeta). As if to prove how awesome and beloved Katniss is, the amount of girls who took up archery skyrocketed following the release of the books and movies. I'm not at all shocked, but I know from high school gym class that archery is not my strong suit. I'll stick to reading and writing. With themes like politics, wealth, technology, violence and love, The Hunger Games has a little bit to offer everyone. I already have Book II checked out from the library, but have to finish rereading To Kill a Mockingbird and Go Set a Watchman before I return to Panem. I've never seen the Catching Fire movie either, so I'm in for some surprises, I'm sure! May the odds be ever in my favor! Now, obviously when a book generates as much buzz as The Hunger Games did, it is probably well worth your time to read the books and watch the inevitable movies. But why wait? You're not proving anything to anybody by holding out. The only person missing out from your choice not to read something is you (and maybe the author). Don't make the silly stubborn mistake I did and avoid a book because everyone else is talking about it. It's not like you have to like it. In fact, you might hate it! But it also might win you a bunch of money if you ever get on Jeopardy! This picture of Y'Jazzmin Christopher, 7, appeared in NPR's story "More Girls Target Archery, Inspired By 'The Hunger Games.'" Image credit Grace Hood/KUNC. After years of having it on my to read list, I finally got around to reading The Book Thief. Luckily, it was an assigned reading for one of my classes, so I managed to kill two birds with one stone, and let me tell you – what a beautiful bird it turned out to be. But if the book was a peacock, then the movie version must have been a pigeon. Using Death as the story's narrator, The Book Thief follows the life of Liesel Meminger, a young German girl who is sent to live with foster parents after her Communist mother flees the country during Hitler's rise to power. After some initial resistance she manages to find love for her new family, especially her accordion-playing papa, Hans Hubermann, who gives her the magical gift of literacy. One fateful night, a young stranger appears on the doorsteps and is quickly ushered inside before collapsing. The stranger turns out to be Max Vandenburg, a Jewish man with a unique connection to the Hubermanns, and they proceed to hide him in their basement. And that's when the story really begins. After finishing the book with tears in my eyes, I decided to rent The Book Thief movie from my local library to compare the two mediums. Now, I must preface this by saying I always find the book better than the movie, but I don't think I've ever been so let down by a book-to-film adaptation in my life. Sure, the movie trailer (above) looks really great and powerful – I agree! But it comes nowhere near the emotion and message conveyed by the book. There are some major discrepancies between the two versions – perhaps most significantly is the film's lack of character development. In the book we see much more of Max's past, and his present. He talks about his dreams of boxing Hitler, develops an exercise regimen to occupy his time in the Hubermann's basment, and, after discovering Liesel's love for the written word, creates two books of his own to give her. It is in these homemade and personal stories that we really see Max's personality and depth as a character. In the movie? None of these things happen. Instead of the homemade books, Max gives Liesel a blank journal. He's almost always unconscious, making him a flat, one-dimensional character: the physically weak Jew wasting away in some cold basement, who only occasionally offers a word or two of encouragement to Liesel. Similarly, the book version of Hans is forced to join the war effort as punishment after giving a piece of bread to a starving Jew being marched through the small town. This act of good-heartedness and humanity is unparalleled in the movie. Instead, Hans is sent into the war only after proclaiming "But he's a good man!" as a Jewish neighbor is being taken away by some Nazi officials. It's a very small detail, but Hans giving away a stale piece of bread, when he himself doesn't have much to eat, adds more to the story than his public outcry in the movie ever could. Another major difference between the two mediums is that, in the book, Liesel's best friend Rudy learns that the Hubermanns were hiding a Jew only after Max leaves the basement (for reasons I will not tell you here). However, in the movie, Liesel actually goes as far as to tell Rudy about hiding Max. These are just a few of the differences between the book and movie versions of The Book Thief. And while it may seem like I thought the movie was complete rubbish, that is really only in comparison to the original text. I would recommend both versions of The Book Thief to anyone who has an interest in WWII, the power of literacy and the goodness of mankind. However, I feel like it is my duty to warn you that, like me, you probably won't find the film nearly as moving if you've already read the book. And if you haven't read the book yet, you should probably try and find the time to do so. The 500+ pages are worth every second, and then some. Way back in the in the 1940s people had this radical idea that there was a certain age demographic who weren't really considered children, but they were not yet adults. They had their own interests, hobbies and trends, and they also had a lot of purchasing power. Thus, was the birth of the teenager, and shortly after that came the genre of Young Adult literature. Even if you've never heard the term before , I'm sure you are familiar with the titles of lots of YA books. The truth is, YA is more popular now that ever before, a moneymaking fact Hollywood has been pretty quick to pick up on. Following the profitable film adaptations of the Harry Potter series, books like Twilight, The Hunger Games, Divergent, The Maze Runner and The Fault in Our Stars hit the big screen, and they all raked in some serious dough. But how? It's not like all the teenagers everywhere are dumping all their allowance or babysitting money into movie theaters ... right? Right. YA books and (and movies) have been so successful because they're not just for young adults! They're also for old adults, and just regular adults too! One of the reasons YA books speak to such a wide audience is because they oftentimes relate to self-identity and discovery, or offer serious commentary about issues like equality, depression, suicide, addiction, the loss of a loved one, etc. These are issues the majority of people generally first come to contact with during their teen years, but they stay relevant the entire rest of their lives. The complex plot lines and multifaceted characters of YA don't just make for a fun, leisurely read or escape – YA can also provide a sort of affirmation about what a reader may be feeling or thinking during one of the most crucial periods of his or her life. Much like everything else in the world, the YA genre is continually changing, and so are young readers' interests. We've finally exited the supernatural woods filled with vampires and werewolves, and I think we're just about ready to leave the futuristic dystopian world (at least for now). What comes next? I'm not quite sure, only time will tell. But one thing is for sure: YA is here to stay and be enjoyed by all. By now, you obviously know I have a thing for books, but what you might not know about me is that I'm a complete and utter francophile. I've always had a strange obsession with France and its beautiful language, which prompted me to take French all four years of high school and host three French exchange students for a couple summers during my teenage years. In college, I minored in French and had the incredibly opportunity to make my second trip to France, this time as an international student in Paris for six months. My boyfriend Taylor and I on a boat cruise down the Seine River when he came to visit me during my semester abroad in Paris. Photo taken by my dear friend Vincent, March 2013. One of the first books I read entirely in French is Antoine de Saint-Exupéry's Le Petit Prince, or "The Little Prince." And now, that story is being turned into a new CGI/stop-motion movie, set to release next fall. The story involves a pilot who crash-lands in a desert where he finds a curious little prince who has fallen to Earth from a small asteroid. On the surface, the plot sounds like just another strange children's book, but it is actually quite philosophical in nature. The two characters discuss questions about life and the oddities of the adult world throughout the story. "Though it's often described as a children's book, one of the many beautiful things about the story is its universal relevance; adults can appreciate it, too, often differently than they did as children,'" states this Mic.com article about the upcoming film. And I couldn't agree more. There is apparently two versions of the film planned, one in English and one in French. Here is the first trailer for the film, in French. I've included a translation below. Old Man: "Oh, oh! I'm here! Up here! Good evening!" Girl: "Once upon a time, [there was] a little prince who needed a friend." Old Man: "I've flown almost everywhere in the world, until something miraculous happened." Little Prince: "Please, draw me a sheep." Old Man: "I've always wanted to find someone to share my story with, but I think this world has become too adult. It's only the beginning of the story!" This movie is going to be a must-see, just as the book is a must-read – for kids and adults alike. All there is left to do is re-read the book and wait until the film's release next fall! "What is Halloween? How did it start? Where? Why? What for? Witches, mummy dusts, haunts. It's all there in that county from which no one returns. Will you dive into the dark ocean, boys? Will you fly in the dark sky?" My favorite season is autumn, my favorite holiday is Halloween and one of my favorite authors is Ray Bradbury. What better way to celebrate this time of year by combining the three? I seem to find myself reading a lot of Bradbury as of late. Most people know the man for his highly acclaimed book, Fahrenheit 451, but I much prefer his lesser-known stories. Earlier this week I closed the last page of From the Dust Returned, and I immediately picked up The Halloween Tree – one of my favorite stories since I was a child. I grew up watching the animated version of The Halloween Tree, and it was easily one of my most-played VHS tapes (after all, I watched and re-watched it no matter what time of year it was). I think the reason I loved the movie so much was how effortlessly it captured the spirit of Halloween, especially for a child growing up in the Midwest. And the book? Why, the book does the same, but even more successfully. If you are unfamiliar with the story, The Halloween Tree is a tale of eight trick-or-treaters who gather at a haunted house near the edge of town looking for a spooky adventure. But when their friend Joe Pipkin, "the greatest boy who ever lived," is surprisingly absent from the festivities, the boys must venture through time and space to look for their friend and discover the true meaning of All Hallows' Eve. As their sinister guide, Carapace Clavicle Moundshroud, whisks them around the globe in search of Pipkin, the boys learn how Halloween was celebrated around the world since the beginning of mankind. 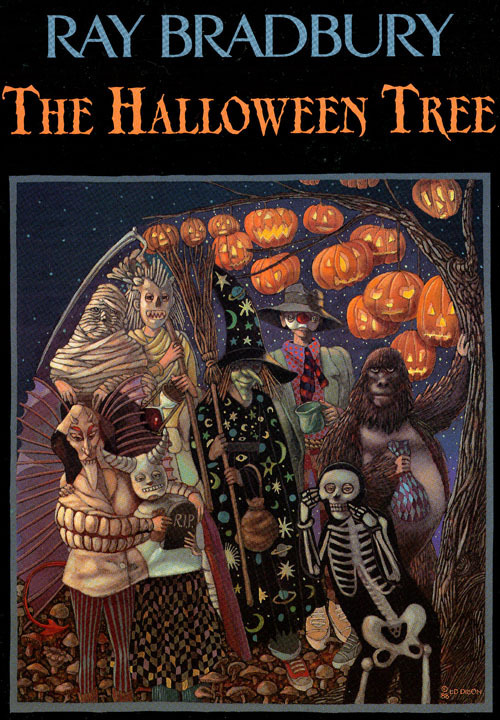 Despite being somewhat of a forgot work of Bradbury's, The Halloween Tree is what made him one of my favorite authors. His singsongy prose and seemingly endless sentences transport you to that "small town by a small river and a small lake in a small northern part of a Midwest state," mentioned in the book. His words make you feel like one of the youngsters dressed up in Halloween garb, running through the streets with a crisp, autumnal breeze lapping at your heels as you sprint from door to door, yelling "Trick or treat!" Maybe one of the reasons I love Halloween the most, is because it feels like one big contradiction. It makes me feel more aware of the unknown, while somehow simultaneously exuding a sense of familiarity. I'm scared just as much as I'm comforted. I'm here, but I'm also there. And so goes the story of the children in The Halloween Tree. Will the gang find their beloved Pip before it's too late? Where will they find him? And when? Welcome to Day Three of Teen Read Week, a national adolescent literacy initiative created by the Young Adult Library Services Association (YALSA). This year marks the week's 16th year of encouraging teens to be regular readers and library users. I know we all still yearn for the glory years of whiteheads, braces and awkward interactions with your middle school crush, but teens actually do have the upper hand with one thing: YOUNG ADULT FICTION. I have no shame in reading YA, and you shouldn't either, because it's not just for teenagers. Sure, if you actually read it when you're a teen it's a bit more socially accepted and all your friends have probably read the book too so you can actually have really great book discussions while you mom is driving you to the mall before Tommy Prescott from next door calls you later to see if you want to go see that movie, right? Joking aside, the teenage years are a great time to bridge the gap between children's books and that million-page adult stuff. With all the hormonal confusion, shutting out the rest of the world with a good book could be just want adolescents need to avoid some of the stress of growing up (or – if you're like so many of us out there – already being grown up). I think the reason so many people love reading YA (myself included) is because it's a genre that's not afraid to take risks. Sure, there were a few years where every YA book seemed to be about vampires, and I think we're finally almost done with the here's-another-book-about-a-dystopian-future trap that authors have been so easily falling into (because hey, we know it sells). But I can't wait to see what's next for YA, because the genre has given us some pretty neat things already. I'm hoping for a new series with a particularly strong, positive body image message, personally. With so many YA hits like Harry Potter, The Fault in Our Stars, If I Stay and The Hunger Games trilogy cashing in at the box office, you know that those wanna-be wizards, hopeless romantics and archery enthusiasts are picking up the books too – and that's all that matters. The beauty about YA is it makes reading cool. At a time in a teen's life when being cool may be the biggest priority, that can serve as extra motivation to pick up a book and discover a new, lifelong hobby. If you develop a strong enough passion for reading as a young adult, there's no way you're going to let the joys of reading slip away as you enter your older years. I mean, there may not be enough time to read for fun in college unless you forgo eating, sleeping and personal hygiene, but you'll graduate eventually. And when you do, those YA spectaculars will still be waiting for you. I know they were for me! The way I see it, there are two types of people in this world: Those who insist on reading the book before watching the television show or movie, and those who prefer to watch a story unfold on the screen before picking up the book. I, most definitely, am the former. I always read the book first. Always. With the book-turned-movie "Gone Girl" now in theaters, I find myself – yet again – putting off a trip to the cinema until I turn that final page. I love comparing books and movies, but only after I read the work in its original and intended form. As someone who hopes to have a published novel one day, I feel it's only fair to the author to read before watching. But that's not the only reason I always choose books first. I love books because of how they make you use your imagination. When you read a book, you create the images of the characters and settings based simply on the author's descriptive words. But when you watch the movie first, those images are spoon-fed to you, and they're not your own. They're some Hollywood big shot's interpretation of an author's descriptions. On the rare (and most of the time, accidental) occasions where I read the book after watching a visual adaptation, I found it hard not picture the film's actors and actresses instead of creating my own images. Where's the creativity in that? And let's face it, the sense of accomplishment you feel after finishing a 900-page book just isn't the same as ejecting a 120-minute DVD from its player. A lot more work goes into reading a book, and if you're already familiar with a story because you binge-watched the first season on HBO GO, you probably won't have that same motivation to read it cover to cover. The book is always so much more detailed than the movie or television show. The complainer in me prefers to grumble about what was left out in the movie rather than admit, "Oh, that makes more sense now. They didn't really explain all that back story in the movie." I often ask people which method they prefer, and when they tell me they're movie-then-book people I make them defend their reasons. They normally say something along the lines of not wanting to ruin the movie by reading the book first, which is a fair enough answer – because movies can be ruined. Books cannot. Based on my very unscientific conclusions of non-randomized sampling, I've found that despite people's reading-watching preferences, they always say the same thing: The book is always better. And there's no arguing with that.